Medical assistants are in great demand in California, with double-digit job growth expected well into the current decade. Medical assistant schools and programs are available in several different educational venues in California, including career colleges, community colleges and vocational schools. Several of these schools and programs even offer an online option. While medical assistant salaries vary depending on the area, the hourly median wage in California is almost $2 more than the national wage. If joining a growing field in a busy state sounds like a good plan, find out what's required to join the ranks of medical assistants in California, including education, certification and more. When looking for a career in health care in California, a degree in medical assisting can get you on the right track. You'll work with patients, taking medical histories, checking vital signs and performing other routine tasks in a professional health care office or hospital. But it’s important to do the research to find the program that meets your career goals and provides the best education possible. 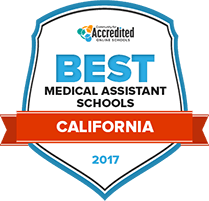 To help, we created our list of the Best Schools for Medical Assisting in California in 2017, ranked for class size, programs available, cost and other factors. See who made the cut below. At Santa Rosa Junior College, students may complete an associate degree in medical assisting with one of three emphases: administrative medical assisting, clinical medical assisting, or clinical and administrative medical assisting. Students in these programs will become fluent in medical terminology and be able to demonstrate a comprehensive understanding of medical and administrative procedures. Many credits offered at SRJC are fully transferable, allowing students to continue their education at a different school if they need to transfer. SRJC also offers several courses in an online format, which largely beneficial to students with familial or work obligations that might otherwise interfere with earning a degree. Contra Costa College offers a two-year associate of science program with an emphasis in medical assisting that will prepare students for employment in a hospital, clinical, or medical office. Students under this program will be able to concurrently complete a certificate of achievement in medical assisting and office technician, as well as a certificate in medical terminology. Most Contra Costa credits may be transferred to other two-year and four-year schools of higher education, and also honors applicable credits earned at other institutions. While Contra Costa associate programs often take around two years, students can meet with their academic advisor to build a schedule that utilizes winter and summer classes, allowing for the quickest route to graduation. Students who complete the medical assisting program at West Valley College will be able to demonstrate a well-rounded understanding of administrative and basic medical procedures common to hospitals, clinics, and medical offices. This 42-unit program will take the typical full-time student just over three semesters to complete, allowing them to begin their career as a medical assistant as quickly as possible. One of the greatest benefits of studying at West Valley is its affordability; students are able to get the same quality education as is offered at four-year schools of higher education without paying the high prices common to upper-level schools. In addition to completing an associate of science degree in medical assisting at Cabrillo College, students also have the option to concurrently complete a certificate in medical assisting or phlebotomy, further specializing their learning for a competitive job market. Through a series of in-class and clinical courses, students will learn basic skills in medical terminology, human anatomy and physiology, and understanding medical laws and ethics. Students coming in from a different school of higher education may be able to receive credit for their previously completed classes, given that they match Cabrillo College’s degree requirements. Student who are interested in beginning a career in the developing field of medical assisting may wish to consider completing one of Saddleback College’s medical certificate programs, including administrative medical assisting, clinical medical assisting, and comprehensive medical assisting. Graduates from these programs are able to demonstrate the skills medical employers are looking for in an employee, such as an understanding for medical billing and coding procedures, the ability to aid in basic examinations, and a comprehensive understanding of medical terminology. Students attending Saddleback College may wish to complete some of their coursework in an online format, allowing them to further their education without disrupting their daily lives. Canada College offers a variety of associate and certificate program emphases in medical assisting, including medical billing specialist, administrative medical assistant, and medical coding specialist. Each of these programs—ranging from 18-unit certificates to 60-unit associate degrees—can help to facilitate student career advancement in a medical environment. Students enrolled at Canada College become part of an inclusive and thriving community characterized by social interaction and academic integrity. Extracurricular time can be spent by participating in student government, attending on-campus events, or joining one of Canada College’s student-operated clubs. Students who study at Cuesta College can kick start a career as a medical assistant by completing an associate of science degree in medical assisting. Students are taught all necessary clinical skills, methods of managing a medical office or clinic, and communications skills that employers are looking for. Students who have busy schedules may wish to consider studying in either online or evening sections, allowing them to maintain their daily obligations outside of school. While Cuesta College offers a college education at a cheap price, students also have the option to apply for a variety of financial aid opportunities to further lighten their financial load. Allan Hancock College offers its medical assisting certificate programs in both a daytime format (medical assisting certificate) and an evening format (medical billing certificate), allowing students to work towards career advancement whenever best fits their schedule. Students who complete an associate degree program with Allan Hancock may go on to immediately begin a career in their field of choice, or may transfer to a four-year university to complete a bachelor’s program. Online learning is a beneficial option for students who have non-curricular obligations that may cause time constraints when it comes to scheduling courses. Financial aid is available to all eligible Allan Hancock students. The medical assisting program at Chabot College prepares students to take the Certified Medical Assistant Exam, allowing for career advancement in a medical-based environment. Medical assisting students will learn to perform both administrative and clinical duties, making them well-rounded employees with high marketability in the current job-market. Students transferring in from a different school of higher education may receive credit for classes taken at other schools, so long as it is applicable to their Chabot degree. Students also have the option to meet with career counselors to develop their resume and practice their interview skills. A degree in medical assisting earned at Moreno Valley College can help prepare students to begin a career as a medical assistant in a medical office or clinic. This program is designed to develop students’ skills in understanding medical terminology, performing administrative functions such as processing medical billing, and assisting in basic patient examinations. Moreno Valley is an excellent choice for students looking to complete a college degree, but are looking to do so at a cheaper price. Moreno Valley is made even more affordable with its numerous opportunities for scholarships and grants that are available to any qualifying student. California medical assistant schools offer diploma, certificate and associate degrees. Finding a medical assistant school or program in California is the first step to embarking on this growing health career. Our search tool can help you find a school in California that fits your needs, interests, and budget. How does the state define "medical assistant"? They are unlicensed workers who perform non-invasive, routine medical support services under the supervision of a physician, surgeon, podiatrist, physician assistant, nurse practitioners, or nurse midwife in a medical office or clinical setting. The supervising professional must be on the premises when any of these support services are performed. In a secondary or postsecondary education program in a public school recognized by the U.S. Department of Education (DOE), a community college program as outlined in the Education Code, or a private postsecondary school approved or accredited as outlined above. Administering injections and skin tests 10 hours of training. Candidate must show satisfactory performance of at least 10 injections and 10 skin tests. Venipuncture 10 hours of training. Candidate must show satisfactory performance of at least 10 venipuncture and 10 skin punctures. Administering inhaled medication 10 hours of training. Are there healthcare support tasks outside the scope of medical assistants in California? Salaries for medical assistants can vary by thousands of dollars a year depending on location, illustrated by the 2014 wage amounts from the BLS shown in the map below. The highest paying areas are located in or around the San Francisco Bay Area, while the Los Angeles area and Central California have lower wages. Healthcare support jobs are projected to grow by 19 percent from 2014-2024 for a variety of reasons, including an aging baby boom population and growing access to healthcare insurance for many Americans. As a result of a drastically increasing need for all medical personnel over the next several years, medical assisting is projected to experience much faster than average growth through at least 2022. The table below compares California medical assisting job growth with national growth. While there are dozens of medical assisting programs available at a wide variety of California community colleges, private career colleges and vocational schools, we've chosen a few standouts to help you get started. Graduates are able to sit for the CCBMA exam, which includes several specialties including Administrative Medical Assistant, Clinical Medical Assistant or both. Courses include clinical assisting techniques, pharmacology and human diseases. Commission on Accreditation of Allied Health Education Programs. Approved by the Curriculum Review Board of the American Association of Medical Assistants Endowment. The medical assisting program is part of the health, athletics, wellness and kinesiology division of the school. Courses include a phlebotomy lab, an EKG lab, and billing & coding instruction. An accelerated medical assisting program is available, with graduates receiving the medical assisting certificated of achievement. The website for the certifying body that conducts the California Certified Medical Assistant (CCMA) exam. It offers comprehensive information on taking the exam, including required qualifications, what the exam includes and more. Enabled by a contractual arrangement with the National Center for Competency Testing (NCCT), MMCI provides a method of medical assistant certification in California. Pearson is the administering body for the California Certified Medical Assistant exam. Students can schedule exams, find a test center, and learn about testing accommodations. Learn about medical assisting and salaries in California, and sort through job listings. The Medical Board of California is responsible for regulating many medical careers in the state, including medical assistants. The website offers extensive information on the California Code of Regulations and medical assisting.